With advance level of production facilities and well organized set ups, we provide steel stillages to cater broad spectrum of industrial applications. We make use of the high grade steel to produce these steel stillages. 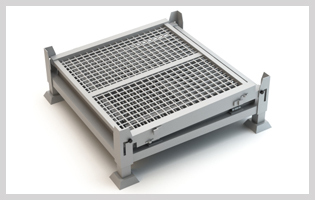 Considering different applications, we offer sturdy and cost effective range of the product. The reinforced steel sheets are used for the construction of the steel stillages. With exclusive flexibility, our stillages are proven too convenient for the holding and transporting of wide range of products. It is also easy to handle for the unusual shaped products. It is also simplify the handling of difficult objects. We also provide perfect customized solution as per requirement. We possess huge quantity of stock of the material to meet bulk requirement.